This paper investigates the process of trade integration between the enlarged European Union and the Newly Independent States (NIS), focusing on the new EU member states (NMS) and selected NIS (Russia, Ukraine, Belarus, Moldova and Kazakhstan). The paper analyses the evolution of the regional and commodity composition of trade in the countries concerned. A detailed market share analysis reveals the emerging trade specialization patterns. There has been a general trade reorientation of both NMS and (less so) the NIS towards the West. 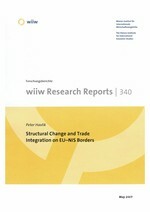 The recent trade developments on EU¿NIS borders indicate a closer trade integration among the NMS, declining trade integration among the NIS, as well contradictory shifts in NMS¿NIS exports and imports. The importance of the NIS as export markets for the NMS is growing, in particular for the NIS neighbours. The bulk of EU exports is made up of manufacturing products. By contrast, EU imports from the NMS and NIS display a much more diversified pattern. The key NMS manufacturing export commodities to the NIS are chemicals, machinery & equipment, motor vehicles and food products, whereas NMS manufacturing imports from the NIS are dominated by basic metals, refined petroleum, chemicals and fabricated metal products, and there is a high concentration on just a few basic manufactures. The NMS increasingly specialize on high-tech and medium-high-tech products. The wide-ranging modernization and industrial restructuring in the NMS has been facilitated by the process of EU integration and by massive inflows of FDI whereas in the NIS the resource specialization generally increased as reforms and restructuring were delayed. It is questionable whether the NIS will be able to revamp their industrial structure without significantly stepping up reform efforts, trade integration and attracting more FDI.